An indictment issued against Kevin Smith, 23, was unsealed in court on Monday in relation to the attempted robbery and shooting of U.S. District Court Judge Terrence Berg. According to the indictment, Smith was arraigned on charges of Conspiracy to Commit Armed Robbery from Jan. to May 2015, Armed Robbery, Assault with Intent to Murder, Felon in Possession of a Firearm and Felony Firearm. The Wayne County Prosecutor's Office said Berg was outside of his home taking the trash out around 9 p.m. on March 5 when Smith walked onto the front porch and said he had a gun. Smith said he and another man wanted to get inside the judge's home. 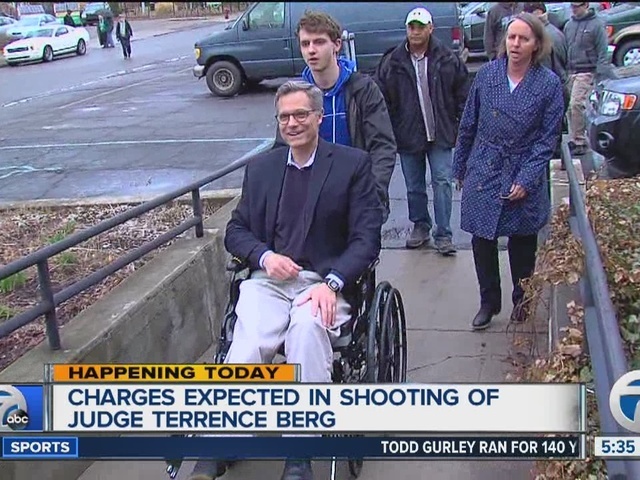 when Berg refused, Smith allegedly pulled out a gun and shot Berg in the leg. According to the indictment, the second person involved is not going to be named as he is a witness. Wayne County Prosecutor Kym Worthy said Smith is believed to have been involved in as many as 13 other robberies from Jan. to May 2015 in the University District. Worthy said the robberies mainly involved senior citizens. Smith pleaded guilty to Armed Robbery and Felony Firearm charges and was sentenced to 13-30 years plus two more years for the firearm charge. The indictment also mentioned two other men involved in the string of robberies in the University District. Timothy Russell faced charges of Armed Robbery, First Degree Home Invasion, Felon in Possession of a Firearm and felony firearm. He pleaded guilty to Armed Robbery and Felony Firearm charges and was sentenced to 13-30 years for the robbery and two years for the firearm charge. Dondiego Adams' case is still pending, according to the indictment. He is facing charges of Armed Robbery, First Degree Home Invasion and Felony Firearm.